With the US dollar being kicked back and forth like a soccer ball, its reputation in tatters, and value sliding steeply against all major world currencies, it might help us feel better about ourselves to know that we’re not the worst currency in the world. In fact, we don’t even make the top ten. Thanks to Fox News for the following rankings of the five weakest currencies in the world right now – our comments included, of course. Sao Tome and Principe ($1 = 14,350 dobra): This small island off the western coast of Africa can also lay claim to NOT having the worst economy in the world, even though it’s close. As the second smallest nation on the continent, Sao Tome and Principe exports cocoa, palm kernels, and coffee. Vietnam ($1 = 16,975 dong): With perhaps the worst named currency in the world, at least according to western ears, this former foe and ally has had a tough time of it financially, though a recent rise in tourism helps. Visitors are normally asked to pay for everything in dollars. Turkmenistan ($1 = 24,000 manat): This former Soviet republic has significant oil and gas resources and starkly high poverty. What else would you expect with the misfortune of receiving a power mad “president for life,” Saparamurat Niyazov as your first leader? His forward thinking included abolishing opera, ballet, AIDS, and other scourges. Thankfully he’s dead now. Somalia ($1 = 35,000 shillings): What do you do when your deathbed economy can’t seem to catch a break? Some countries, like the US, turn to government bailouts. Somalia decided to try widespread piracy on the high seas as a means to create a flourishing nation. So far, not so good. Zimbabwe ($1 = 642,371,437,695, 221,000): We’re not sure what comes after trillions – zillions? Our experts tell us it’s actually quadrillions. 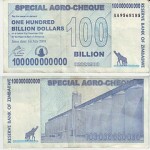 Either way, it costs $35 million Zimbabwe dollars to buy an egg. If you plan to emigrate, maybe you should try for Somalia instead. At least they’re still on the charts. Once more, our sincere thanks to Fox News for the preceding information. While our home currency might look like Rocky Balboa in the 12th round, it ain’t dead yet, and looks a heck of a lot better than these jokers. * Read our brand new post below that discusses the factors that often create a dismally weak currency.